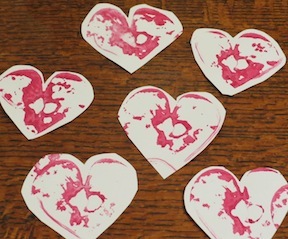 Are you looking for some unique kids valentine crafts? 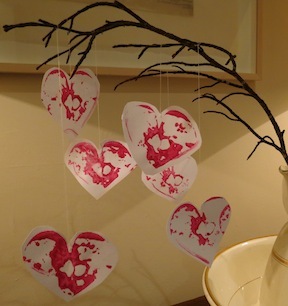 Why not get your kids making this Family Valentine Tree. You can then write what you most love about each other on it! This make a really special house decoration over Valentines Day! 1. Start by cutting one apple in half and shaving the bottom two edges off to make a heart shape (see picture below). 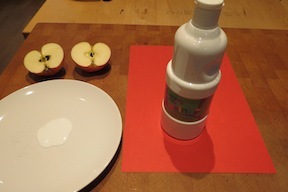 Put some paint on a plate and using a paintbrush spread it across the apple. We decided to use pink paint on white paper but you can choose whatever valentine colours you like. 2. Stamp you apple across your piece of paper. You will need to repaint the apple every couple of times you stamp. Fill the paper with prints! 3. 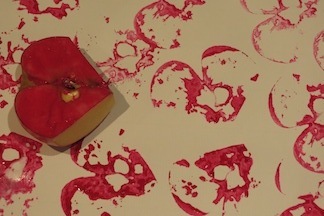 Cut out your apple prints into heart shapes. If you have printed on a large sheet you will probably have over 20 prints. Choose the best ones - perhaps 15 of them - and use those as the ones you cut out. 4. Now you need to attach a thread to the top of the heart. Older children who can use a needle and thread can do this themselves. 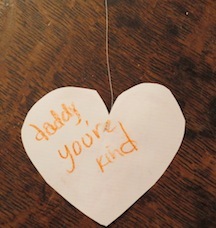 Or, if your kids are too young you can just stick a piece of thread to the top with PVA glue or sticky tape. 5. 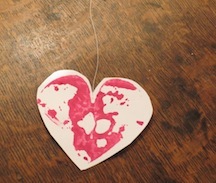 Once you have got all your hearts with threads attached, find a time - maybe after a meal - when the whole family can write things onto the back of the hearts that they love about each other. When this is finished place a small branch in a vase or jug - you can stop it moving around by putting some gravel stones in the bottom of the jug - and start hanging the hearts onto the tree!